1965-73 Mustang High Performance Spring Perch with a synthetic elastomer bushing. When you are checking out and/or restoring the front suspension on a 1965-73 Mustang (or other Ford for that matter), one of the most common parts to replace is the spring perch. This is also referred to as the spring seat and bushing assembly. SU-1291 This is the 65-73 Mustang Spring Perch with the roller bearing. These are sold as a pair and are absolutely the ultimate spring perch for street or track. 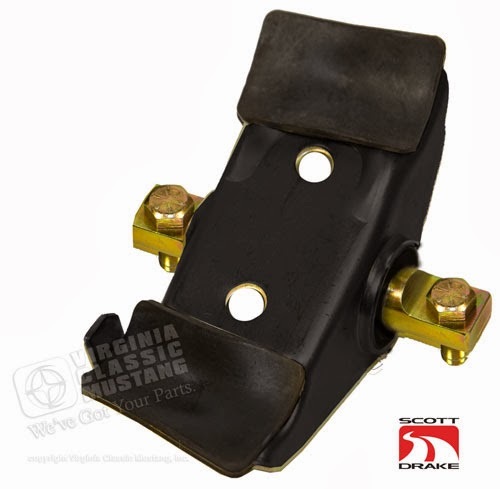 The roller bearing perches are a bit pricey at $199.95 a pair, so now we have another alternative from Scott Drake Mustang Parts. It is our part number SU-1292. It is a Mustang High Performance Spring Perch with a synthetic elastomer bushing. It's like polyurethane but will not squeak, and it's only priced at $59.95 each. This bushing also rotates a full 360 degrees for ease of movement and installation. A grease zerk fitting is fitted at the bottom center of the bushing also. 65-73 Mustang Convertible Top Trim - New Parts!